One of the biggest problems is that a sizable percentage of immigrants are willingly and intentionally failing to integrate into British society. This in and of itself is not a big deal, as many immigrants of different faiths who settle in developed countries have historically followed a similar pattern. However, what is happening in the UK should be a scary wake up call for us here in the United States for a number of reasons. First, the failure to integrate has led to the creation of Muslim-only communities. Some of these communities have developed their own set of rules, cultural identity and desire to separate themselves from the”evil” ways of the population at large. 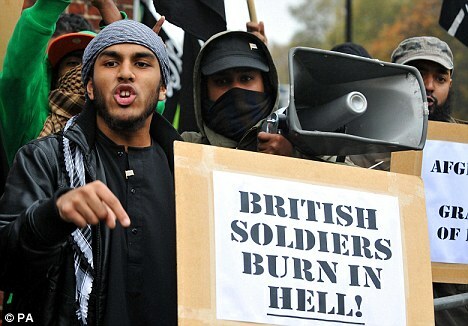 They have their own Sharia street patrols, intimidate and threaten “outsiders” and manipulate local and national laws to their advantage. Many of these community leaders have explicitly stated that their goal is to impose strict adherence to Islamic practices on the rest of the country. People who have spend generations in these communities have fled, seen their property values plummet and have little or no support from local governments or law enforcement. In fact, it is a well-known fact that police are not welcome in these areas, and officers will try and avoid entering these zones at all costs. The very presence of police or efforts from local politicians to create more tolerance and openness is often met with huge protests, civil unrest and all-out riots. While the US legal system is different from Great Britain, and our police are much more proactive and less intimidated than their British counterparts, both countries share something in common. We are both being victimized by sustained efforts by extremist leaders to manipulate our laws in order to further their agendas. The very freedoms that we cherish are being used against us on a daily basis in order to curb and limit our rights under the guise of intolerance or bigotry. We’ve all heard stories of Sharia women who have sued governments, and won in certain cases, over the requirement to remove their head coverings for ID photos. School districts have been taken to court because they do not provide meals that are Halal, or prepared in accordance with Islamic law. There was also a recent incident where retirement home patients were forced to stop eating pork, which is a staple in the UK, because kitchen staff who were Muslim refused to cook meals that contained this “unclean” meat. These are just a few examples of the birth pangs that the west is experiencing as free nations struggle to find a legal basis to protect the freedoms and way of life of its citizens while accommodating the needs of immigrants. Unfortunately, the United Kingdom is undergoing a fundamental shift in their society and immigrants are leading the charge. Changes are also occurring here in the United States as well, but they are a little more subtle and slow moving. However, it is clear that we will also experience some of the tensions that the UK is facing in the not-too-distant future. The question is how will we deal with this problem and how much of our rights will be curbed along the way. As birth rates among Muslims in Europe continue to increase at a staggering rate and more and more extremists find their way to the United States, it’s only a matter of time before we will be facing conflicts within our own borders that can jeopardize our own security and way of life. This looming crisis extends far beyond ideology or a philosophical argument. The next breakdown of our society can very well be brought on by pressure from extremists that can lead to anything from harassment and sporadic violence to terrorist attacks that can destabilize our nation. As we continually focus on being prepared and surviving disasters or SHTF scenarios, we should also pay attention to how the world is changing due to extremists who are forcing their world-view upon free nations. The question is how do we prepare for such a contingency so that we can keep our families safe, maintain our way of life and escape the turmoil that is going to hit our shores in the not-too-distant future.